The warm glow of lovely, handmade ceramic Candle Houses fascinates me whenever I visit my local Christkindlmarkt; I wanted to bring some of this warmth into SL. 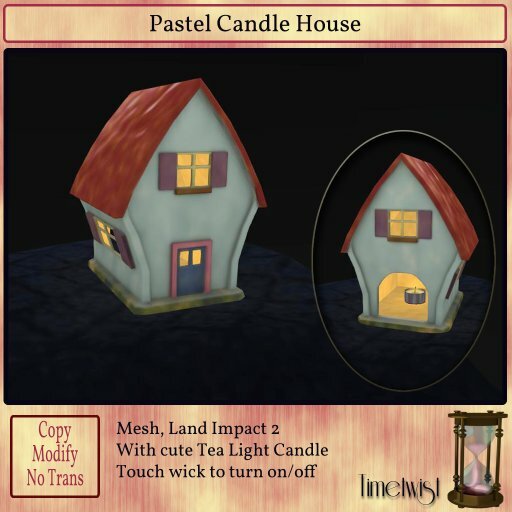 The Pastel Candle House consists of course of the ceramic house and its candle; we've also included a spare tea light candle, because it's cute and small and can be added to lots of places! Simply zoom in and touch the candle wick to turn on or off. Original mesh and texture, with handmade LODs and Physic shapes. With a Land Impact of only 2, it won't eat much of your prim allowance. I know. Just 2. We couldn't believe it. In other news: we really need a proper in-world store. For now I've put the candle house inside Kubismos (our faux-greek park building), but it looks a bit random. Sorry!